This year marks ten years since Animal Collective released Merriweather Post Pavilion, and coincidentally ten years since the recordings of their landmark gigs at The Bowery Ballroom and Manhattan Center Grand Ballroom crashed the NYCTaper servers. Since then we’ve seen Animal Collective countless times and have covered shows by each member individually, none more than Avey Tare. Back in 2017, Avey returned to The Bowery Ballroom to play songs off Eucalyptus and preview his most current album, Cows on Hourglass Pond. Never content to linger in the same place too long, last week’s show at Market Hotel was heavy on the Cows songs, with one song each from Eucalyptus and Down There. The sole unreleased song from this set, “Enjoy the Change,” was also played back at Bowery but surprisingly didn’t end up Cows. I recorded this set with Market Hotel’s installed Audio Technica 4051’s, combined with a board feed courtesy of the venue and engineer, Eric. The sound is outstanding. Enjoy! In stark contrast to Animal Collective’s frenetic Painting With, Avey Tare’s latest solo album Eucalyptus is a winding, intimate bedroom album. I’ve listened to it a few times since its July release and it’s certainly one of those records that opens up to you over time. For his short tour supporting the record, Avey seemed to acknowledge the difficulty of translating the Eucalyptus songs for a live performance. The songs take on their own live existences, heavily adapted from their recorded counterparts to be presented in front of an audience. Most of the songs he broke out Monday night at Bowery Ballroom, though, aren’t even on Eucalyptus. Like Animal Collective’s early years, rather than playing songs the audience already knows, Avey instead plays a new round of songs: “Enjoy the Change,” “Ono Lemonade,” “Saturdays,” “Eyes on Eyes,” “The Aging Heart,” and “Sew Happy” are all new compositions unheard until this tour. (That’s half the set if you did the math.) But that’s the great thing about the audience Avey has cultivated: they’re along for the ride whether it’s hits or songs they’ve never heard before. We were, however, rewarded with one special treat when Geologist came out the help Avey with the Animal Collective track “Man of Oil” from their recent Meeting of the Waters EP. We recorded this set with the Schoeps mk22’s set up at our usual balcony location at Bowery, combined with a board feed from FOH Danielle. The sound is excellent. Enjoy! Last year, I wrote about this site’s history with Animal Collective and celebrated the serious rejuvenation of the band’s fortunes. That show at Irving Plaza was our first introduction to the live performances of the Painting With material. We also caught the show later in the year at Terminal 5. In the ensuing months, Animal Collective released two EPs with material related to the album and continued to tour. 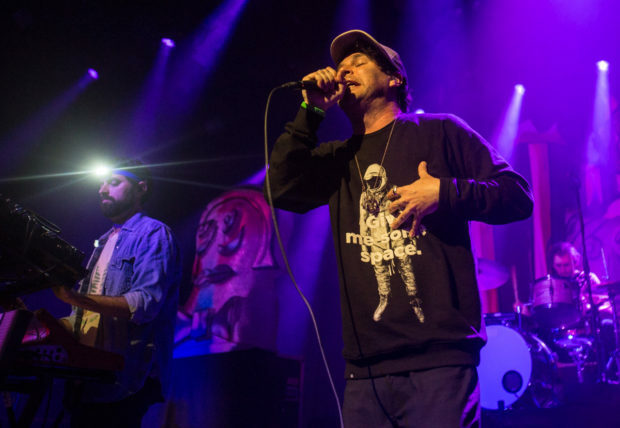 This Spring saw their return to NYC for a show at the new Bowery Presents venue Brooklyn Steel and last Tuesday’s show was perhaps the most powerful Animal Collective performance we’ve experienced in more than a decade of seeing the band. This was our first experience at Brooklyn Steel and I was impressed. There’s definitely a nice vibe to the venue, and the sound quality from our vantage point was on point — full spectrum rich sound with no boominess at all. The intensity of the acoustics in the venue served the band well, as Animal Collective provided thundering bass beats to accompany the multi-layered three-pronged sound delivery system. 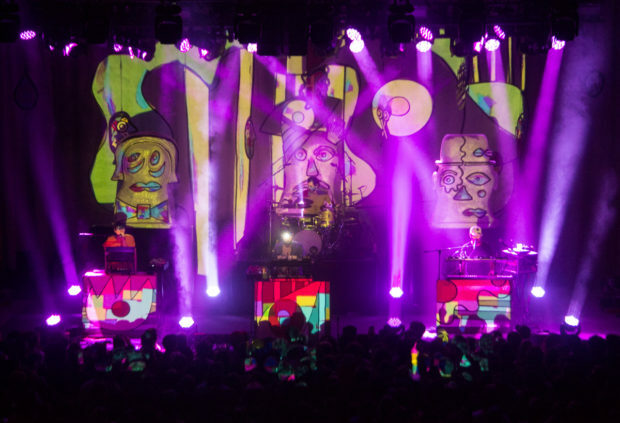 This tour’s version of the band features Panda, Geologist and Avey across the front accompanied by drummer Jeremy Hyman at center rear of the stage. The set featured much of the recent material but also satisfied long-time fans with older tracks democratically selected from their many releases and some deep cuts not heard in years. The sold-out crowd called the band back after a healthy 75 minute main set and we were treated to an extended encore set that closed the night with a lengthy and rousing version of “Summertime Clothes”. Animal Collective’s tour continues with some June and July shows, all dates [here]. I recorded this set with the Neumann hypercards mounted at the elevated area inside of the soundboard area and with the mics raised high. The amazing sound in the venue and the choice of microphones worked perfectly as this recording is really quite superb. Enjoy! 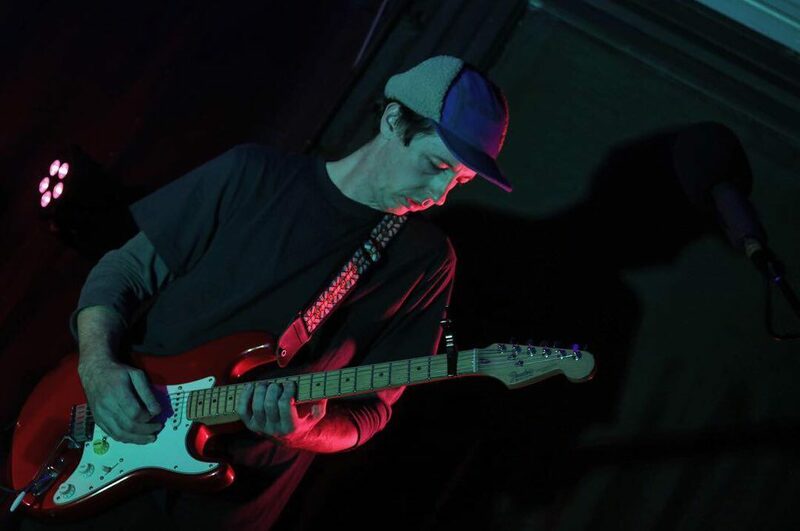 Avey Tare (aka Dave Portner) has been a prime writer and performer for Animal Collective for more than a decade, and has participated in many other projects during that time. However, it wasn’t until late last year that the first proper Avey Tare solo album was released. Down There (Paw Tracks) is a very personal album, which related both in theme and sound a dark period in Avey’s life. At its release, he declared that these songs would not be performed live. But one year later, it was a bit of a surprise that an Avey Tare solo tour was announced. 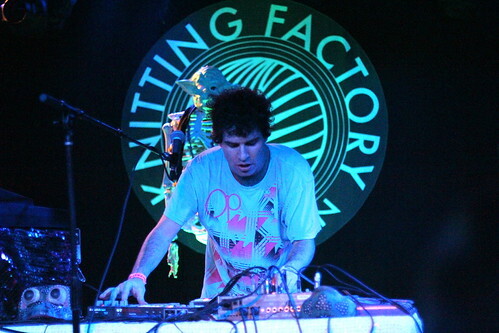 At Knitting Factory on Friday night, Avey performed an outstanding fifty-minute set. The show included four songs from Down There, and in the AnCo tradition, five new songs were featured. The set was played as a single suite, with each song naturally progressing into the next. Of the new songs “In Photographs” and “Slow Words” sound nearly complete and are very strong compositions. Its currently unclear whether these songs are contemplated for a new Avey Tare album or will be ultimately become Animal Collective songs. Of the Down There material, “Lucky 1” and “Laughing Hieroglyphic” were highlights, and we’re streaming the latter. At the conclusion of the set, Avey answered the encore chants by informing the crowd that although he had no more songs to play, he would return to NYC in the near future. Avey Tare’s current tour continues throughout this week and next with dates in the Midwest and three shows on the West coast. I recorded this set with the DPA 4021s raised to eight feet on a pole in front of the soundboard booth and mixed with an excellent feed from the soundboard. Since the crowd was quite respectful during the music, the mix is about 70/30 in favor of the room mics and the quality is superb. Enjoy! Download the Complete show in FLAC [HERE] or [HERE]. 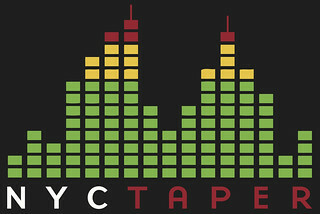 If you download this recording from NYCTaper, we expect that you will PLEASE SUPPORT Avey Tare, visit his Facebook page, and purchase Down There from Paw Tracks [HERE].